When deciding what jewelry to offer and sell, we try and get a little bit of something for everyone. 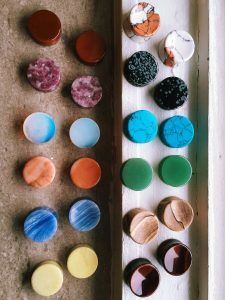 Our stone plugs have quickly become a favorite to employees and customers alike. 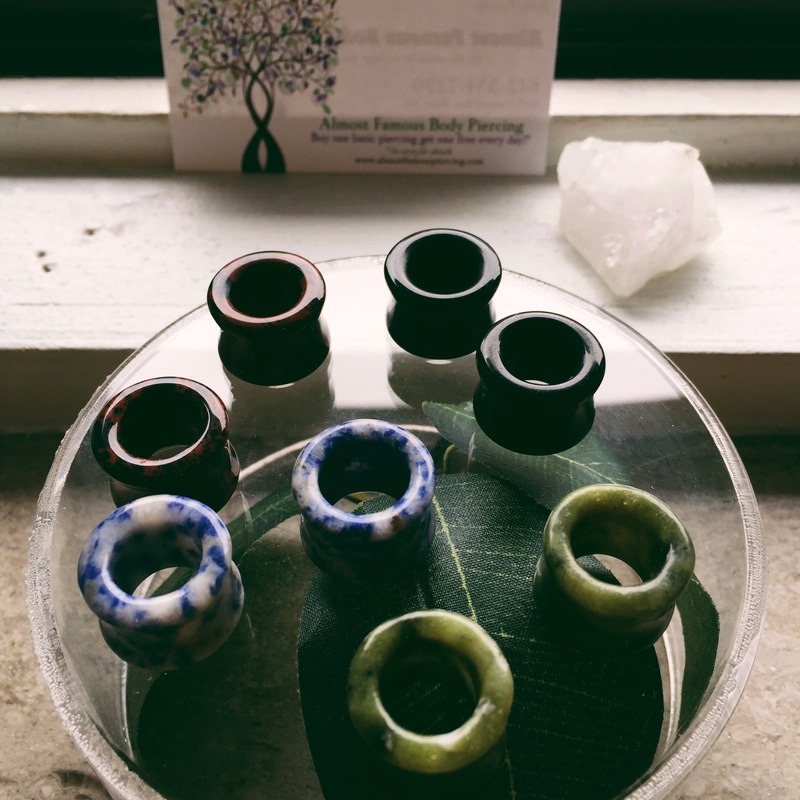 Some people choose stone plugs for their obvious beauty, some because they are a natural material, and some because they believe in the spiritual healing properties that stones can contain/possess. Turquoise is one of the oldest known healing stones. In many cultures, it is seen as a sacred gift from the gods. It was honored by Native Americans and made into rings, necklaces, and bracelets because they believed that it would protect and bless them when wearing it and that it also carried great wisdom. Turquoise absorbs negativity from the body and mind and protects against negative energy. Many people bring turquoise into their homes because it brings peace as well as good fortune. Turquoise differs from most stones in the sense that the person handling it must learn to balance and harmonize with the stone rather than the stone to the person. When doing so, the stone can help us to understand ourselves and helps control our emotions, intentions, and ideas so that they can be more conducive to our lives. Aventurine is a lovely green colored stone that is said to be very balancing. It symbolizes tranquility, creativity, and patience so it is helpful in stimulating creative inspiration and to help the wearer/holder develop a more positive outlook on life. Since is it energetically a gentle stone, it can enhance happiness and gives a sense of calm and balance in undesirable situations. In Folklore, it is said that Aventurine is favorable in helping with balancing blood pressure, sinus problems, nausea, allergies, fevers, and headaches. Tigers Eye is a beautiful brown color with a bands of yellow-gold color through it. Tigers Eye was traditionally carried as an amulet to protect against curses and ill-wishing but would also give you courage and strength of will. For those that do yoga and/or deal with chakras, Tigers Eye is known to aid in Kundalini Awakening. It is also a very serene stone so it grounds you, physically and spiritually, via the root chakra and helps to become more calm and centered. Tigers Eye is a very powerful stone that restores balance and brings clarity so it is often used in stilling to the mind in order to move deeper into meditation. Stones that are golden in color are often times used to strengthen the masculine essence in a person. This helps a person striving for a balanced energy, of both the feminine and masculine type. If you’re feeling stressed from common daily tasks or even work, carrying around a piece of Tigers Eye can help correct the problems that are making you feel this way by giving you focus and bringing peace into your life. Jade has been used in jewelry for centuries. Ancient People believed that wearing Jade would give them more body strength and therefore add longevity. Men from the Mayan tribes would wear jewelry made from Jade to show that they were from a higher class while men from lower classes would wear wood and bone. Jade has been tacked the “dream stone” because it helps soothe the mind by releasing negative thoughts. It also lets go of suppressed emotions through insightful dreams and helps one remember their dreams. It has also been said that Jade has a restorative property and can assist in alleviating pain and removing toxins from the body. Please note: The material listed on this web page is for informative purposes and should by no means be used in place of traditional medical treatment/medical advice but rather in addition to.